As fleets know, many variables can affect test results for truck fuel-saving technologies and practices. To name just a few: Trucks get better mileage in warmer weather because the air is less dense. Rain and snow increase rolling resistance. Heavy traffic can affect aerodynamics. And drivers’ different skill levels and habits can have a significant ­effect, industry experts said. C.R. 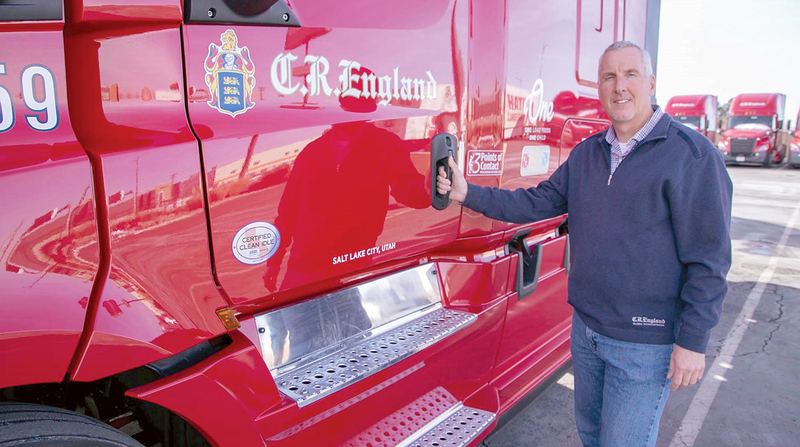 England, for one, assigns little weight to fuel savings claims by manufacturers and suppliers, said Ron Hall, the fleet’s vice president of equipment and fuel. The company does its own testing, and though it coordinates with suppliers, it doesn’t let them define the test. “We’re pretty savvy about what’s probably going to have a result, or what’s not,” he said. The carrier does its best to run tests scientifically. It employs two dedicated trailers, two dedicated tractors, three drivers who know how to remove variables and an ­almost full-time analyst. Trucks run multiple routes on one relatively flat course and another where half is a 6% grade, and then the company weights the flat route as 80%. The control truck and the test truck run together with enough separation that they aren’t drafting off each ­other, but the drivers maintain communication so that if one slows because of traffic, the other will, too. On the return drive, they switch trucks. The next step for promising technologies is confidence-level testing. After C.R. England begins implementing the technology, it performs in-service testing to validate. It compares fuel economy data monthly for all implemented versus nonimplemented units. “For the most part, we’ve had a high validation rate in service,” Hall said. Salt Lake City-based C.R. England ranks No. 25 on the Transport Topics Top 100 list of the largest for-hire carriers in North America. Mike Roeth, executive director of the North American Council for Freight ­Efficiency, said fleets should ask manufacturers about their testing processes and pay special attention to whether they conform to protocols from the Society of Automotive Engineers and American Trucking Associations’ Technology and Maintenance Council. Then, they should install the technology on some trucks and confirm the claims. Smaller fleets with limited testing resources should look to similar fleets. Roeth said each testing type has limitations. For example, track tests are performed with no wind because the pro­tocol requires run consistency. The real world is windy. As a result, aerodynamics technologies sometimes perform only half as well as claimed. That’s what C.R. England found. When trailer skirts were introduced, manufacturers claimed they offered a 7% improvement, which might occur in a 50-mile-per-hour crosswind. But in most real-world situations, the gain was 3.5% to 3.75%, which was still worth the investment, Hall said. According to NACFE, the best practice is to run a test for a year. “Our recommendation is ask a lot of questions of the manufacturer and the truck builder, run as many tests as you can afford, talk to other fleets about what tests they ran and what they’ve seen with it,” Roeth said. Since 2012, NACFE has been tracking about 20 major fleets, representing about 4% of the trucks on the highway in regional and longhaul applications. It uses those results to produce an annual fleet fuel study, its most downloaded report. The organization is studying 85 technologies and practices, an increase from 69 in 2015. Those 85 pertain to tractor and trailer aerodynamics, powertrains, chassis, tires and wheels, idle reduction and fleet practices. The adoption rate for those technologies among those fleets has increased from 17% in 2003 to 44% in 2017. Some technologies cannot be adopted at the same time. The fleets have seen fuel efficiency gains of 2% annually from 2011 to 2018, a higher rate than in 2003-10. Participating carriers enjoyed average fuel mileage of 7.28 mpg in 2017, up from 7.14 in 2016, after seeing only a small improvement the year before. Meanwhile, the industrywide average for the 1.7 million tractors in over-the-road use was 5.91 mpg, though those included fleets running irregular routes with irregular hauls. NACFE said those high-efficiency fleets were saving $8,864 per truck over the national average, assuming trucks were running 105,041 miles with diesel costing $2.65 per gallon, the yearly average price in 2017. A simple analysis found about a 2.8-year payback for those technologies. The study has found that big fleets that adopt fuel-saving technologies tend to keep them even when diesel prices fall because they know prices eventually will rise. Adopting, discarding and then returning to a technology or practice can be costly and time consuming. The participating fleets’ preferences are instructive. While trailer-related technologies increased the most during the study’s middle years, fleets turned more of their attention to powertrains in 2013-17. Aerodynamic hoods, fenders, bumpers and mirrors were used by all the fleets. The use of some technologies was falling. In the study, 6x2 axle configurations were used by only 13% of the fleets, with the total number declining 12% from the year before. Limiting speed to less than 65 miles per hour had dropped 9%, though it still was used by 84% of the fleets. Hall said C.R. England has increased its speed from 63 to 65 miles per hour for driver retention and comfort and to improve utilization. Roeth pointed out that truck and engine manufacturers can access a truck’s data. Those companies have more ­advanced engineering tools and will consult with fleets on how to run as efficiently as possible. Ohio-based Ploger Transportation, which has about 50 trucks, has worked with Volvo Trucks to improve its mileage, and in turn, it provides Volvo useful real-world information. Now, trucks with optimized specs can hit 9 mpg, said Joel ­Morrow, co-owner of Ploger Transportation. By working with Volvo, the fleet learned that it wasn’t running as heavy as it thought it was. Company executives assumed trucks were hauling an aver­age of 71,000 to 72,000 pounds. Peter Blonde, ­senior product marketing manager at Volvo Trucks, was skeptical. Instead, the company was averaging in the low 60,000-pound range. In response, the carrier started spec’ing 400-horsepower, 11-liter engines instead of 500-horsepower, 13-liter ones. “Understanding that load profile is extremely important, and I think it’s one of the things that a lot of fleets really miss and get wrong,” Morrow said. Ploger is a smaller fleet, but like larger ones, it must carefully consider its return on investment, so it takes its testing seriously. Morrow has a few test units and a couple of trusted drivers. He uses PedalCoach to score the drivers and ensure they are operating at peak efficiency, reducing that variable. Ploger makes multiple stops and maintains a 3:1 trailer-to-truck ratio where trailers serve as mobile warehouses. For that reason, most aerodynamic ­trailer add-ons don’t make much sense financially. Instead, the fleet has concentrated on optimizing engine parameters and other changes. The fleet was running an expensive 5W-30 oil, but tests against a 10W-30 semi-­synthetic, which costs less than half, showed no difference in mileage. The carrier went with the ­cheaper oil. Other manufacturers said they use truck data to work with fleet customers. Scott Barraclough, technology product manager at Mack Trucks, said the company can see how a truck has been driven and suggest electronic parameter and spec changes. Paige Kean, a corporate communications manager with Daimler Trucks North America, said DTNA consults with customers who give them permission to access the data and who choose a consulting option. Kurt Swihart, marketing ­director at Kenworth, a truck brand of Paccar Inc., said the manufacturer uses Paccar MX engine data to work with fleets on a case-by-case basis. Carriers also are looking at more than fuel economy. Perforated mud flaps did not offer C.R. England a return on investment with fuel but did when dura­bility was added. But durability is more time-­consuming to test. In that case, the carrier performed a 100-unit in-service test for a year. Sometimes technologies must be combined to reach a return on investment — for example, tire inflation technology along with wheel covers. “The two standing alone didn’t pencil, but the two combined do,” Hall said. Nic Signorini, director of supply management at ­Ryder System, said his customers must consider both fuel efficiency and costs. He said the company does consider manufacturers’ claims, but it also takes them “with a grain of salt” and performs real-world testing. Signorini said fleets must be aware that newer technologies can result in unintended conse­quences. In one case, a multi-­position device was damaging tires in one of the positions because there wasn’t enough clearance.